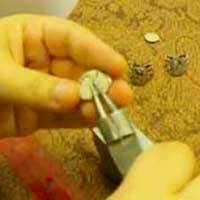 If you've been wondering how to make a really cool steampunk ring, you've come to the right place. 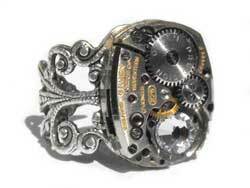 On this page you'll find a steampunk ring video showing how to make one by Jen Hilton of JLHjewelry.com. You'll find text instructions below the video. Jen Hilton's work can also be seen in a couple of really cool books. Be sure to check out her contributions in 1,000 Steampunk Creations and her projects in Steampunk Style Jewelry by Jean Campbell, a compilation book of projects by numerous artists. This is a quick project, but with glue curing time, you'll need to plan to work over a couple of days. 30 minutes one day, and 30 minutes another day should be more than enough time. 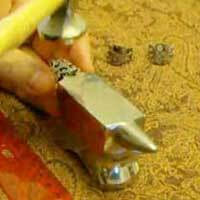 Place the filigree ring base on the flat horn of your anvil and lightly hammer it. Rotate the ring and hammer it again to make sure that its even. Use your screwdriver to pry off the watch face. Remove any clock hands and gears. Take the crown off too if you want to. 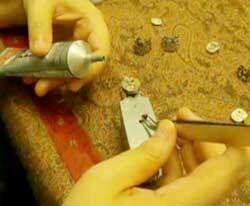 Use E-6000 glue to glue the watch part onto ring base. Let sit to harden overnight. Use tweezer to remove any excess glue. 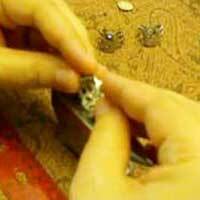 Use the tweezers to grab one of the flatbacks and apply a touch of E-6000 glue to the back of the crystal. Tap them down into place.